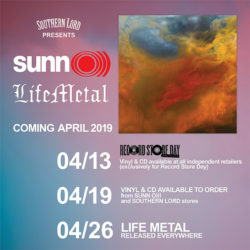 Sunn O))) is pleased to collaborate with Record Store Day (#RSD19) to release Life Metal for the first time on CD and vinyl on April 13th via USA/UK/EU indie retail. April 26th marks the official release date of the CD, digital and all other vinyl via Southern Lord, and CD and LP will be available to order from SUNN O))) and Southern Lord stores on April 19th. Life Metal, their first studio album in four years, will be supported by SUNN O)))‘s first US tour since 2017 and the premier US tour of their 2019-2020 season, including stops at The Masonic Lodge in Detroit, Howard Theatre in Washington, DC, Agora Theatre in Cleveland, Ohio, Rockefeller Chapel in Chicago, Illinois (by demand second show added), The Caves in Pelham, Tennessee, and Brooklyn Steel in Brooklyn, New York. Dates and details can be found below, with more info to come soon. SUNN O))) has also revealed two very special listening events in London and Paris in the lead up to the release. These are free, open to the public and available on a first come, first serve RSVP basis. Details and a band statement below. Watch SUNN O)))’s Life Metal album teaser on YouTube HERE. RSVP ticketed event, available to reserve today HERE. Event commences at 5:00pm. This is a free Pitchblack Playback event; there will be two sessions commencing approximately 7:00pm and 8:30pm. Limited space available, RSVP HERE. Review copies of Life Metal will be issued in the weeks ahead. For coverage of SUNN O))) in The Americas contact dave@earsplitcompound.com, all others contact lauren@rarelyunable.com.